01 Jun 2014 What is the temperature or humidity in my roll over time? It often happens that you wind up rolls at certain values of temperature or relative humidity and then store them under different conditions. For some rolls it is important to know when it has reached the storage value. For example, a roll might containing a relatively soft adhesive layer and needs to be brought quickly to a low temperature in order to harden up the adhesive. The question is: how quickly does the whole of the roll reach the low temperature. Similarly, a roll may be wound up with the material at too low a humidity (say 11% RH from over-drying in the oven) and needs to be brought up to a more normal 50% RH. Again, how long does it take the roll to reach equilibrium? The answers can all be found using the Roll Diffusion Calculator. You enter a timescale (in this case 48hr), the width and diameter of the roll as well as the core diameter. The “From” and “To” values are set according to your problem. In this example the humidity problem is being asked, with RH going from 11 to 50%. Why are no units being specified? Because the calculation knows nothing of units. If you are going from 70°C to 25°C or from 70% RH to 50% RH the calculations are the same. The graph autoscales to reflect your choice. On clicking the Calculate button you get the outputs as shown. What’s going on? The graph on the right shows values within the roll over time – in this case starting at 11 and heading up to 50. The lower line is the value at the point furthest from the outside and the pair of lines are different forms of averaging throughout the roll, telling us in this case that the roll has reached an average of ~30% RH. The diagram at the left shows, via rainbow colour-coding, the relative values throughout the roll at the end of the specified time, with red being the original value and purple being the equilibrium value. The core is the white region in the middle. This is all fine. But there’s a problem. To do the calculation we need the value of the diffusion coefficient – basically how fast heat or humidity can move through the roll. None of us know what that might be – so the app seems to be useless! Fortunately it is very easy to measure the diffusion coefficient. Simply take a small roll (e.g. from a narrow width pilot machine) and via a thermocouple in the middle of the roll or via weighing the roll as humidity changes you can quickly get a good idea of how quickly things change within the roll. You then set up the roll in the app and alter the value of the diffusion coefficient till you can replicate the experimental data. 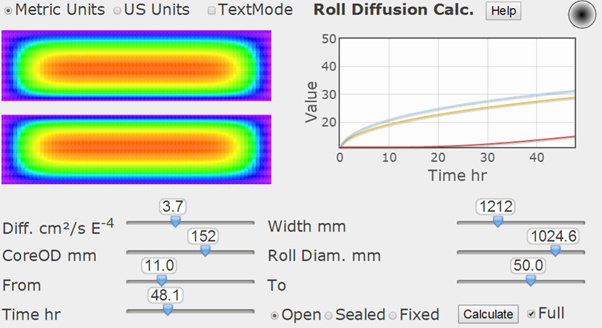 The diffusion coefficient found on the small roll is (for a given material) the same as that on the full roll so you can now calculate with confidence. Although this sounds far-fetched, in reality it works very well. If you are foolish enough to seal the core, as the calculation with the “Sealed” option shows, equilibration is much slower.